Hello, I'm Gregor and I put this site together. 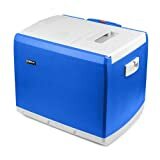 At first, you'll find an overview of recommended car cooler/warmers, followed by a public poll and a general buying guide on car cooler/warmer. Further down on this page, we do link to other well-written articles and reviews about car cooler/warmers. At last, you'll be able to weight in your own opinion in the comments section. If you also want to vote on the best car cooler/warmer, click here to view the poll. Anyone who has loaded a Styrofoam cooler with ice for a trip to the beach or a concert knows what a mess it can make. Advances in technology make the utilitarian box a relic of the past, but the new models on the market use durable materials to keep contents either hot or cold. The 12-volt cord that comes with them plugs into a car’s cigarette lighter to provide convenient access to hot or cold drinks or snacks, and some can adapt to wall outlets in hotels or at home. Trips to the woods for camping, hunting or fishing become a culinary adventure that does not require a stop at an expensive fast food place. Truck drivers can save time by carrying a supply of favorite consumables, and road trips for a family provide an opportunity to enjoy a roadside picnic. Tailgaters love them as a container for ribs and chops that stay warm until long after the game begins. While the market offers designs of many sizes, shapes and features, most provide cooling only. 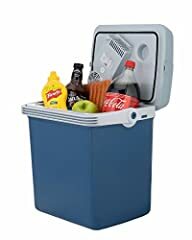 The size of a cooler/warmer matters more to potential buyers than most other factors that affect a purchasing decision. 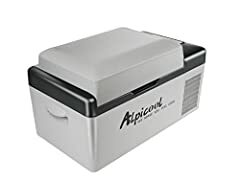 Models on the lower end of the price scale have a volume of 26 to 28 quarts and can hold 32 standard soda or beer cans. Those in the mid-price range can accept 40 quarts and 44 to 48 cans. Shoppers who choose the high-priced models can fit as many as 72 cans in the containers that have a volume of up to 82 quarts or even more. 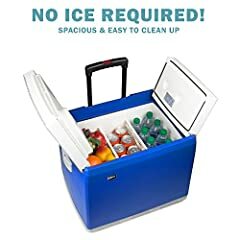 The portability of a cooler/warmer requires it to share space in a vehicle, and it needs to have a spot that allows access to the power source on the dash. A curved side panel enables a container to fit closely to the person who carries it, a convenience when it contains heavy items. Some designs let a container stand vertically like a refrigerator while others lie horizontally like a chest. Other than the soft-sided backpack models, most of the cooler/warmers have uniform shapes that can stack and conform to available space. Shoppers may need to consider the construction of the handle and its relationship to the box to confirm its durability and usefulness. The ability to cool the unit to 40 degrees below the outside temperature gives shoppers a basis for comparing the competing models. Temperatures may range from as low as 3.2 degrees F and up to 50 degrees. A unit can retain low temperatures more efficiently when it has a vacuum seal lid that fits tightly. Thermoelectric technology makes units flexible and applicable for many occasions. Compressor-driven units offer the ability to freeze items, a function that the thermoelectric models cannot accomplish. The price of the compressor models may reflect the use of advanced technology, but shoppers who need to maintain contents in a frozen state may choose to accept the expense. The capability may affect a purchasing decision for owners who need more freezer space than a home refrigerator provides. Shoppers may find some persuasive information in the product descriptions that specify the silent operating capacity of brushless motors. The noiseless units prevent a hum that can distract a driver or impede conversation in a vehicle. Some models claim to lower the internal temperature to as much as 36 to 40 degrees F from a 12-volt source. 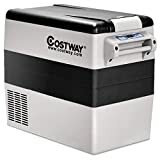 While most manufacturers emphasize a product’s ability to cool without ice, many models allow owners to put ice in the container as an aid in lowering the temperature. However, the decision to use ice in a thermoelectric cooler may require some consideration. While manufacturers do not include an explanation of the scientific principles that make the cooler/warmers work, they may give some hints about the consequences of using ice. Some claim that it can damage the equipment. Cooler/warmers can run for a few hours on a strong battery when a car is not operating, but owners run a risk of draining it and making it unable to start an engine. 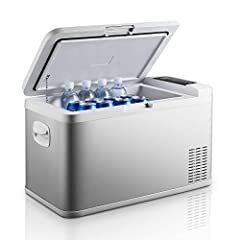 The majority of coolers on the market perform only one function and do not include warming. Some models can produce temperatures up to 145 degrees F to maintain heat during travel. Buyers who want to get an accurate indication of the temperature inside may need a digital cooking thermometer. A thermoelectric cooler/warmer’s performance depends on creating a temperature difference between its interior and the outside, and it may make some contents too hot or too cold. 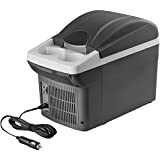 Shoppers who plan to use a cooler/warmer with electric current when the unit does not rely on 12-volt power in an automobile may need to buy an adapter separately. A few models include an adapter with the unit, and some provide AC and DC cords. 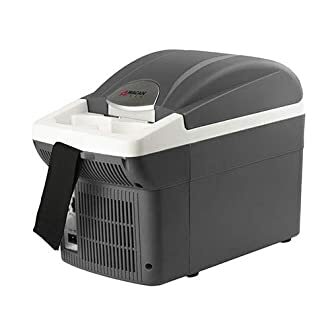 An adapter converts a thermoelectric cooler/warmer to hotel or household voltage with a 110-volt power supply, significantly expanding the usefulness of the unit. Potential owners can benefit from reading the product description for competing models of adapters. Models that may need to provide power for many hours can generate an unacceptable level of heat with an inadequate number of air vents. The length of the power cord may influence a purchasing decision when shoppers want to cover more than an 8-foot distance. A port that lets owners connect USB devices provides some handy conveniences. 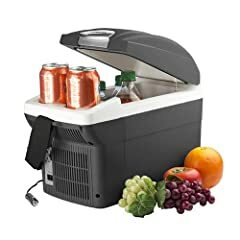 A mini-cooler that can hold one 12-ounce can of soda can get the power it needs from a computer. With smart and attractive designs, the devices can bring a whimsical note to an owner’s desk. 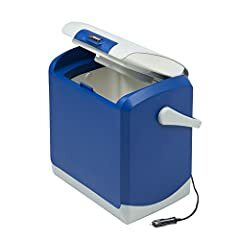 Some resemble a tiny refrigerator with a handle to open its door. The need to crush ice for drinks or smoothies inspired some manufacturers to provide a blender on units that have a 20-volt rechargeable battery. As consumers express preferences for high-tech features, manufacturers comply with innovative designs that offer convenience and comfort. Bluetooth speakers in some models make an outdoor picnic or trip to the beach enjoyable with hours of music that comes from a splash-proof source. A durable unit that can withstand as much as 600 pounds increases the utility of some cooler/warmers as they provide seating or support for heavy tables. Usually available only in the 55-quart models, the adaptability of units that offer many uses makes them desirable to buyers of all ages. A convenience that seems like a necessity for technology users, a built-in USB charger can provide the continued use of devices that seem essential to many owners. A place to charge a phone or a tablet can help buyers relax and enjoy an outing while letting the cooler/warmer provide the power that tech devices need. A fan that can move the air slightly can increase the enjoyment of an outdoor evening, and some can run on electricity from a USB port. An LED light on the lid may shed the illumination that an owner needs. A non-technical bottle opener on the side of the unit can save time for someone who wants a drink quickly. As innovations that can make a cooler/warmer serve more than one purpose, high tech features can influence a purchasing decision. Some models present an LED display of the temperature, and potential buyers can refine the search for their preferences by comparing the high tech features on competing models. New: Our editorial list of additional articles. We decided to gather informartion all around the internet and present you a list of helpful, external links to interesting reads about the best car cooler/warmers and their reviews and guides. You're not convinced by the previous writings about car cooler/warmers? Of course you can just choose by visual impression, that's why we present you all our chosen products at a single glance. A click on any image is enough to open an external link to the best offer we could find. Finally, we want to present you our rating criteria for our car cooler/warmer comparison, so you can better understand and comprehend our recommendations and the rating process itself. Furthermore, we still ask you to keep your eyes open for short term deals in order to make some great bargains with car cooler/warmer in 2019. Published by G. Krambs on StrawPoll.com (last update on 2019-04-18 08:04:02).